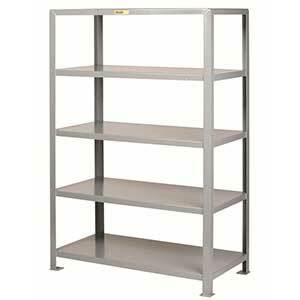 Solid shelves have a higher capacity at 2,000 lbs. ; perforated shelves allow dirt and debris to fall through and can support up to 1,500 lbs. 4SH-1832-72 4 Solid 18" x 32"
4SH-2436-72 4 Solid 24" x 36"
4SH-2448-72 4 Solid 24" x 48"
4SH-2460-72 4 Solid 24" x 60"
4SH-3048-72 4 Solid 30" x 48"
4SH-3060-72 4 Solid 30" x 60"
4SH-3072-72 4 Solid 30" x 72"
4SH-3660-72 4 Solid 36" x 60"
4SH-3672-72 4 Solid 36" x 72"
4SHP-1832-72 4 Perforated 18" x 32"
4SHP-2436-72 4 Perforated 24" x 36"
4SHP-2448-72 4 Perforated 24" x 48"